Along with building websites for the past 20 years, Azure Web Works has provided optimized page content for our clients' landing pages. A landing page is essential to marketing each of your specific products or services and serves two purposes. First, each page is made search engine friendly and optimized with certain keywords, amount of content, and page elements to be more readily found in the major search engines. Second, when your content is clear without unnecessary jargon, answers the questions web visitors are looking for, and points them to the next channel for continuing their purchase, your landing pages can more easily convert searches into sales or help your site's visitors more quickly solve their problems. Thanks to Google's algorithm that gives big brand names an edge in rankings, lesser-known businesses find it almost impossible to compete with similar pages from Amazon, Wikipedia, and YouTube. Amazon's pages may not be necessarily better, but Google tends to put more trust in domains that have a well-established web presence, receive a large share of visitors, and have a reputation for trust. However, that doesn't mean reaching the top of searches is unattainable; it means you may need to utilize a different strategy, such as presenting yourself as a niche specialist with tightly focused content, or publishing authoritative articles on related websites. Giving your content a personal touch with the expertise that comes from being passionate and knowledgeable about your product, service, or field can make a huge difference. Part of our content marketing strategy may include creating and managing your company's social media accounts. 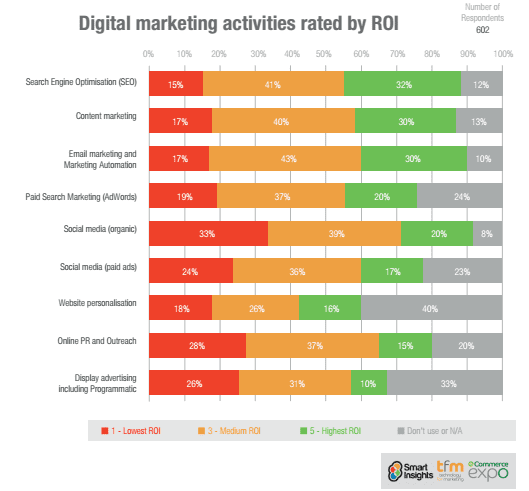 However, we believe clients shouldn't put all their effort into just social media, as this type of marketing strategy has a low return on investment (See "Digital Marketing Activities Rated by ROI graphic" on this page and "76% of Ecommerce Stores Lose Money on Facebook Ads and Don’t Know It"). Studies centered around email marketing, however, have shown this form of reach has a higher return on investment, and we recommend putting forth more effort and resources into reaching your customers through this type of channel in conjunction with posting new content and announcements to social media on an as-needed basis to help maintain social signals for improved SEO. Our service areas include Denver Metro, Boulder, and Fort Collins, and even nationwide, depending on the needs and circumstances of the project. Our content marketing pricing for your projects varies depending on total pages. Cost per page typically starts at $280 and includes on-page optimization.